Esplanade Charles de Gaulle is an urban garden of nearly one hectare in the city centre. The 'Pradier fountain', carved in white marble by James Pradier, Grand Prix de Rome, has been the centre-piece of the Esplanade since 1845. 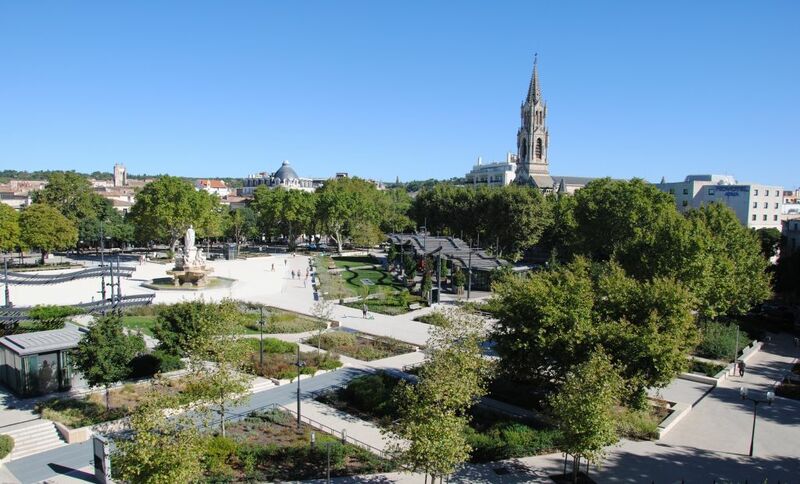 Facing the station, in the middle of a garden, Nîmes welcomes visitors. Look for the female figure on the monumental fountain with a Maison Carrée on her head. Nîmes the beautiful is framed by four watercourses: two nymphs (the Nemausa spring and Fontaine d'Eure) and two heavily muscled giants (the Rhône and the Vidourle).